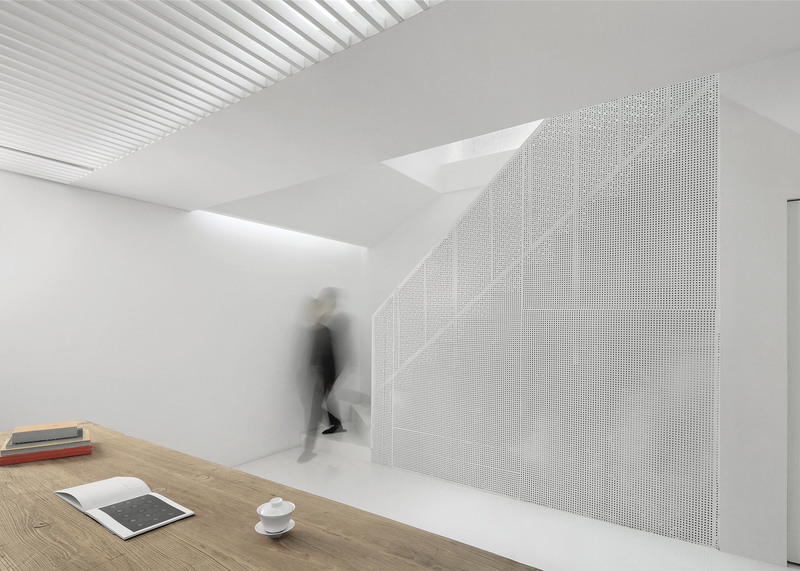 Beijing-based Arch Studio has renovated this house in the city's Dongcheng district, adding a perforated-steel staircase designed to make climbing to the top feel like "walking into the sky". 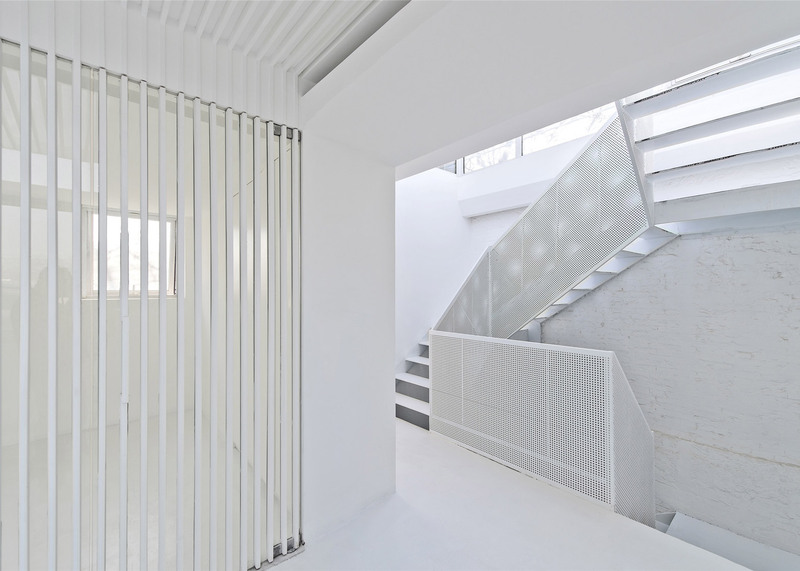 Hoping to brighten and update Xinsi Hutong House, Arch Studio began by removing parts of the existing floors to make room for a modern-looking white steel staircase. 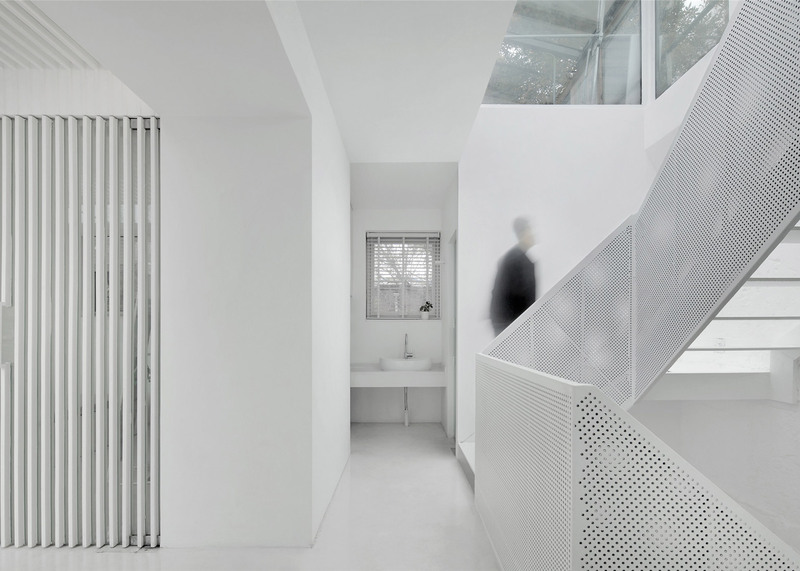 A box-shaped glass extension was added to the roof, allowing daylight to flood down through the open staircase into each level of the three-storey property. 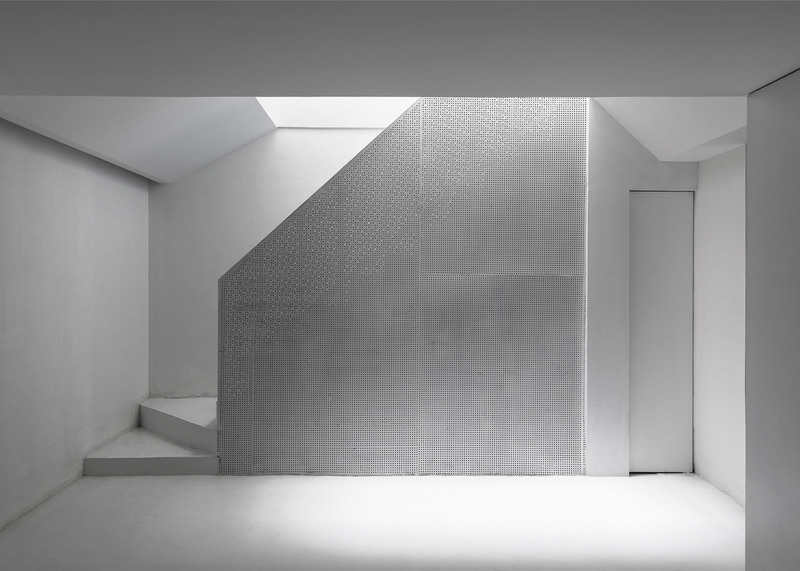 "Part of the floor slabs of the original building have been cut off, through which the stairs were turned into a light beam that gets through all interior floors," said the architects. 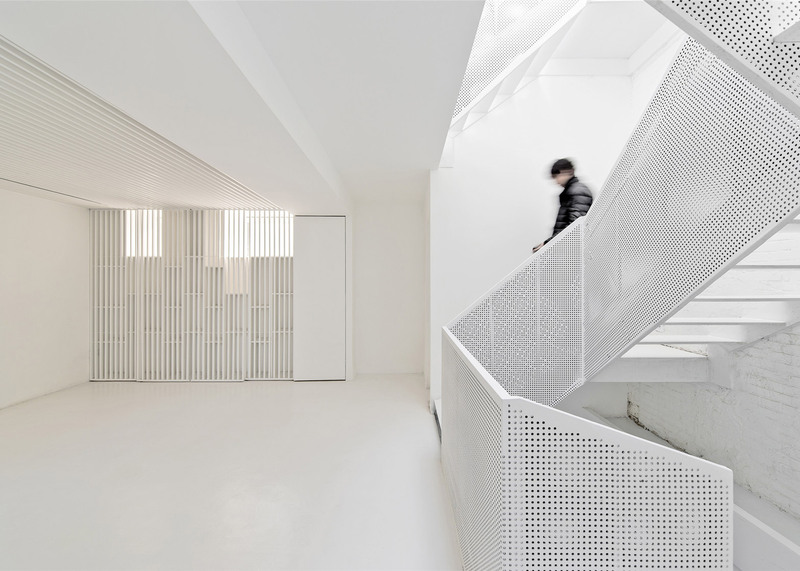 "The natural light reaches down to the basement through the skylight and brings the enclosed interior space to life." 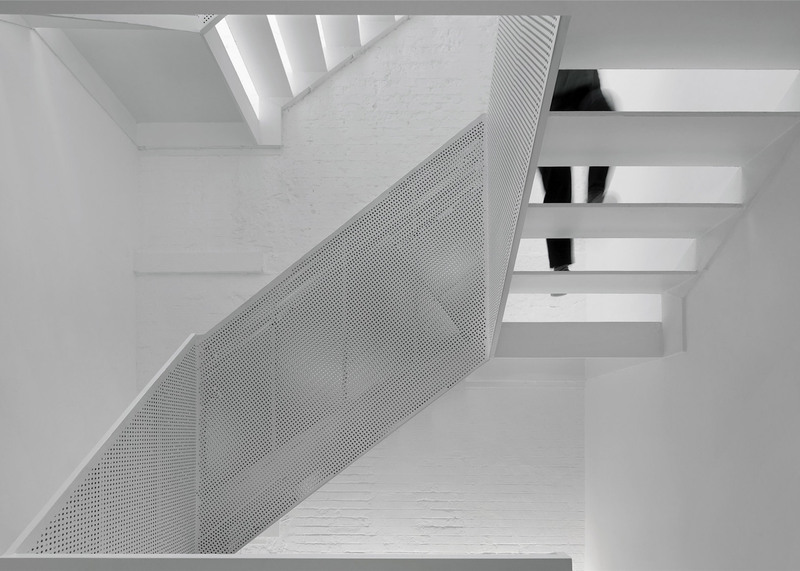 Constructed from steel treads and perforated handrails, the focal staircase is designed to contrast with the existing grey brick facade. 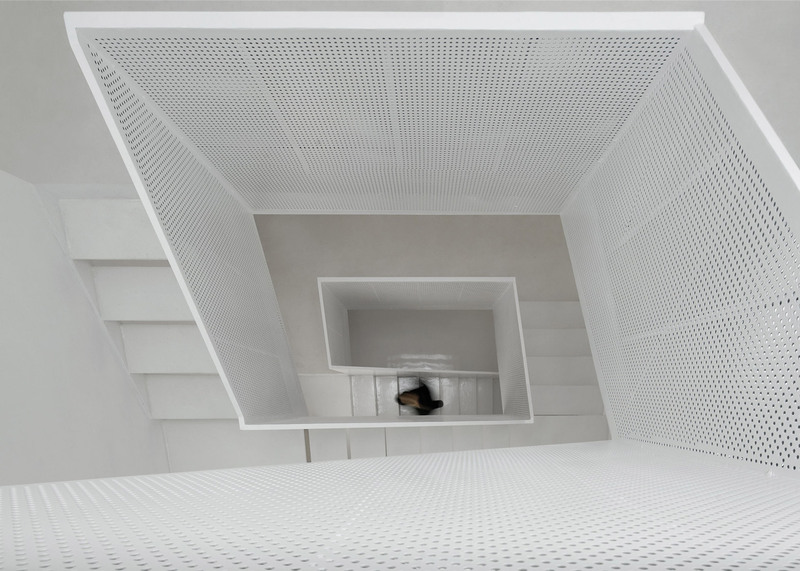 "Whilst walking on the stairs, people may feel like walking in the sky," said the architects. 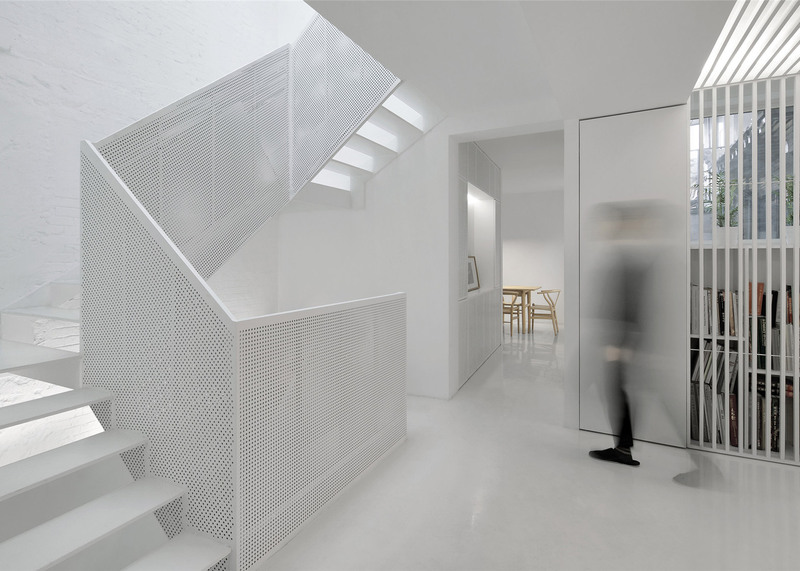 "The bare brick wall on the rear side of the stairs is kept and sprayed with white paint to create micro-comparison of new and old." 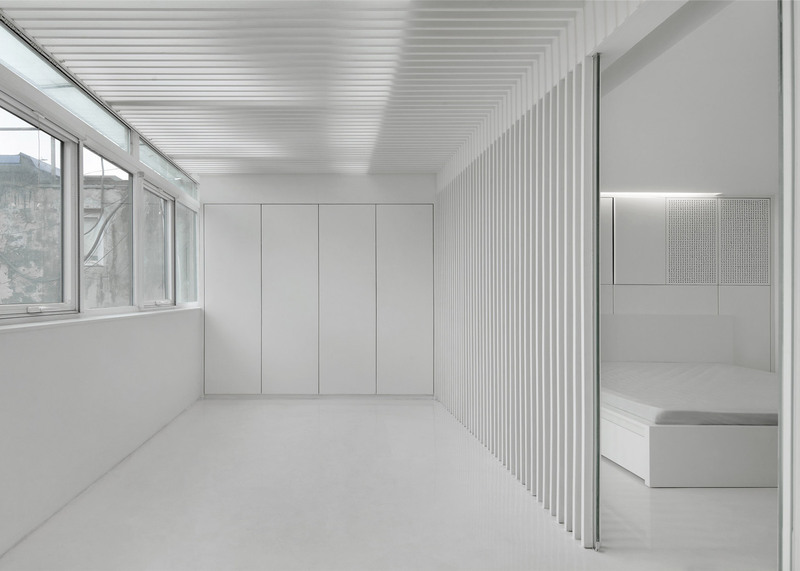 Arch Studio chose white as the fundamental colour scheme throughout the rest of the property, and used wooden "grids" to partition off different areas. 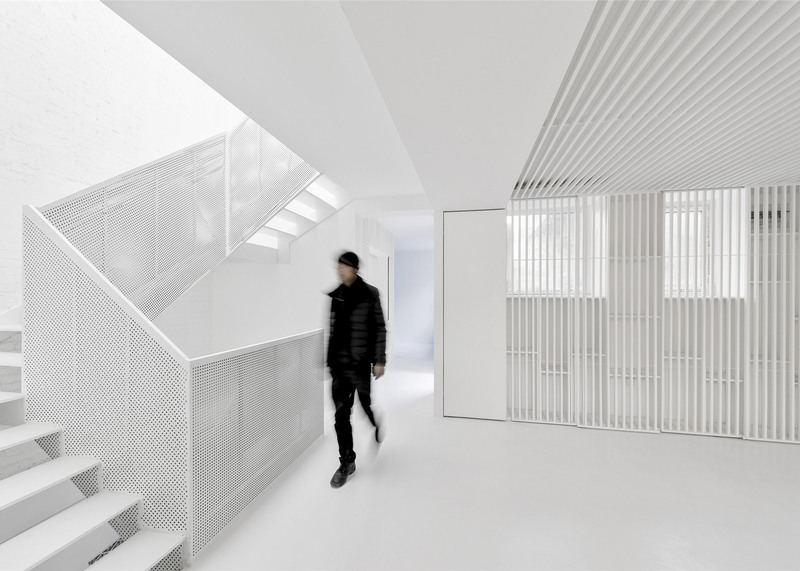 "The colour white brings the space back into a pure and abstract initial state," said the architects. 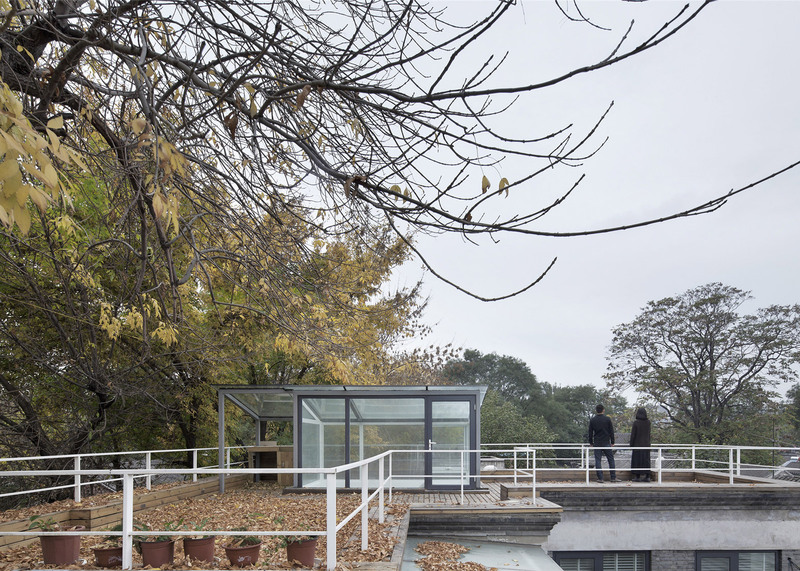 "It creates the feeling of a flowing space by taking advantage of the changing lights and outdoor views." 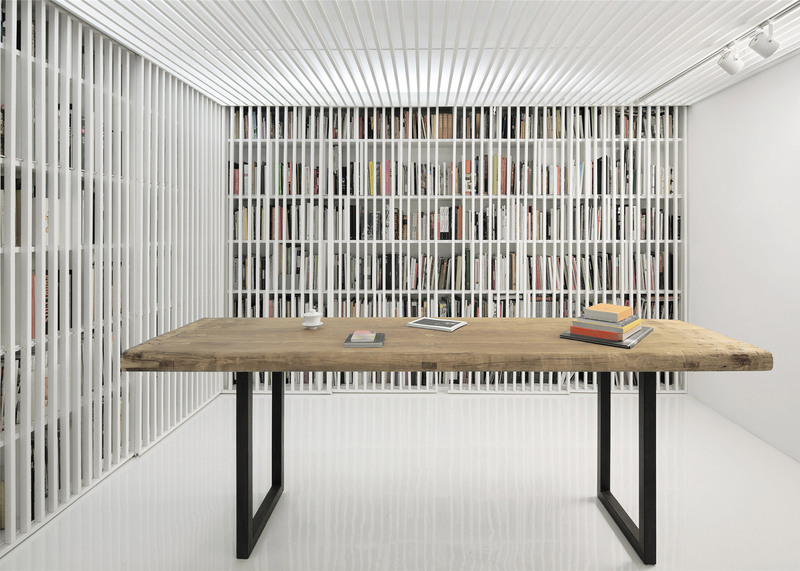 "Grids are scattered across every floor and create various behaviour spaces for tea drinking, hospitality and reading," they continued. 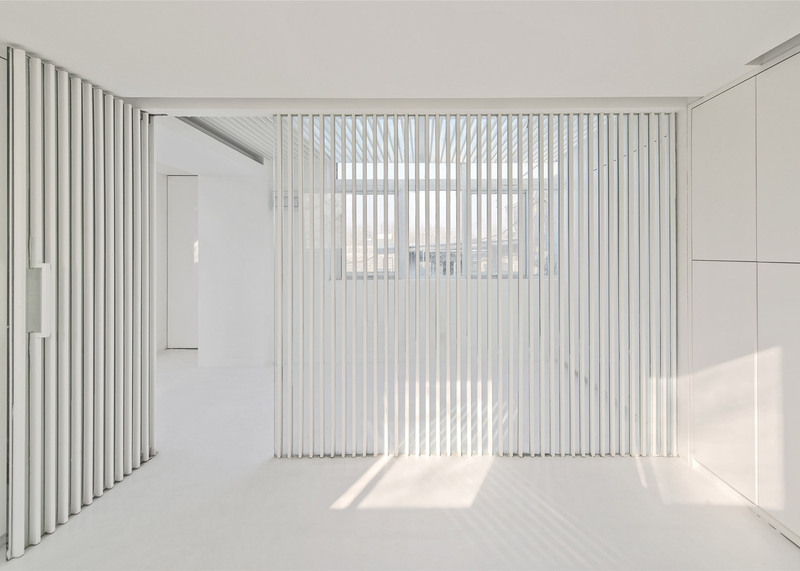 "The introduction of grids filters sight, lighting and views, through which enable the interior to get rid of interference and enjoy peace and tranquility." 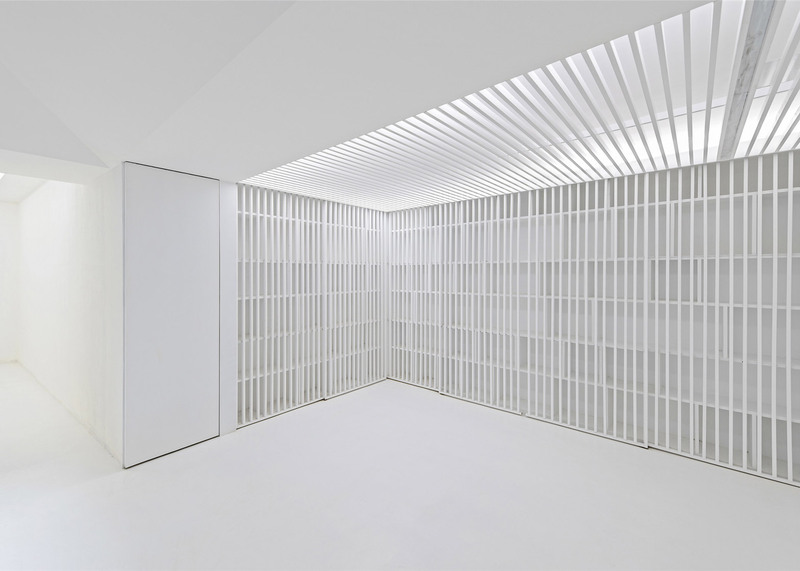 The basement contains an office, living areas are on the ground floor and two bedrooms can be found on the top level. 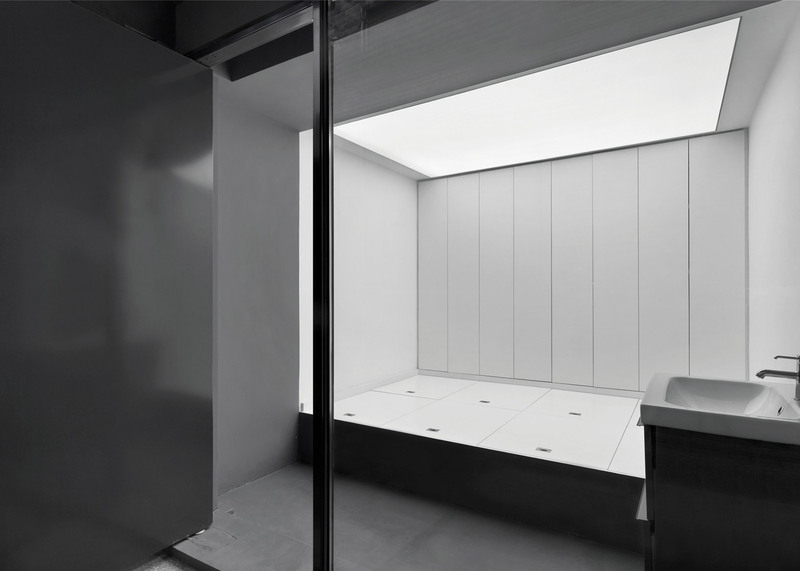 Washrooms are situated on both of the upper storeys. 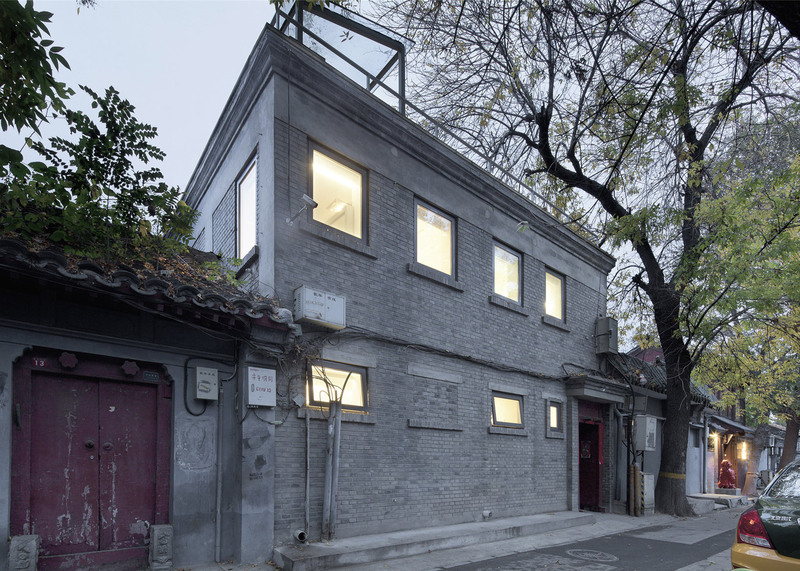 Recently, Arch Studio added foldaway walls to a Beijing art gallery and installed curved glass walls that enclose bamboo-planted courtyards in a tea house situated in one of the city's ancient neighbourhoods.